Creepy bubbling Witch's brew, that is so delicious, you'll want to eat the entire pot! These cauldrons are made out of a donut hole, some green frosting and candy accents. 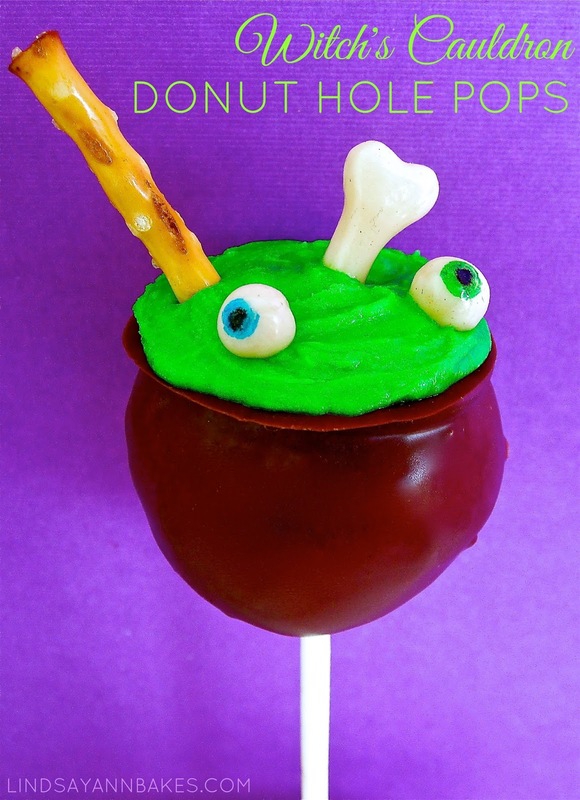 They are simple to make and make a fun Halloween party treat. You can start by using box of chocolate covered donut holes, and skip the dipping process, for a quick simple alternative, or you can choose to dip plain donut holes in chocolate. If you are using chocolate donut holes, simply push a lollipop stick half way through your donut hole. If you are dipping your own donut holes, start by melting a bag of dark chocolate chips or candy melts according to package. Dip the end of the stick into the melted chocolate and push it half way through the donut hole. Let the chocolate dry around the base of the stick, "gluing" it to the donut hole for dipping. Then you can dip your donut hole into the melted chocolate, making sure it is fully coated. Immediately, place donut hole onto wax paper, with the stick pointing up. This will let the excess chocolate fall to the top of the donut hole, creating a lip for your cauldron. Place in the refrigerator to dry. Once chocolate has dried and set, add green frosting or candy melts to the top of your cauldron. Add a pretzel stick for "stirring" the brew and any creepy candy accents you can find. I used vanilla tootsie rolls, and molded them with my hands into bones and eyeballs, using edible markers to add the pupil and iris of the eye. You can even add some more pretzel sticks under the cauldron with some orange candy flames, to create a "wood fired" look. Individually wrap your pops in clear plastic bags for a party favor, or you can create a display for your pops. To create a display that your pops can stand upright in, take a block of Styrofoam and wrap it in Halloween wrapping paper or tissue paper. Push the bottom of each stick into the styrofoam for guests to easily grab and enjoy. Click here to check out more Halloween Recipes & Treats!